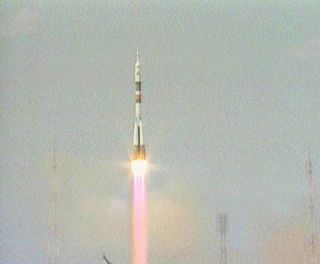 The Soyuz TMA-15 spacecraft carrying three additional crew members to the International Space Station lifts off from Baikonur Cosmodrome on May 27, 2009. The space station?s first six-person crew is adapting to amore crowded habitat than they?re used to. The second half of the team ? Russian cosmonaut RomanRomanenko, Belgian astronaut Frank De Winne of ESA, and Canadian astronautRobert Thirsk ? arrived May 29, boostingthe population of long-term residents at the International Space Station(ISS) from its usual three to six. "It's great having everybody here," NASA astronautMichael Barratt said during an in-space press conference today. Barratt hasbeen serving onboard the orbiting laboratory as a flight engineer for twomonths already. "It's great having the extra bodies and the extra noise.And for us, it's three new crewmates to share the adventure and share theworkload." Romanenko, De Winne and Thirsk launchedMay 27 aboard a Russian Soyuz rocket from Kazakhstan's Baikonur Cosmodrome. In addition to Barratt, Japanese astronaut Koichi Wakata andstation commander Gennady Padalka, a Russian cosmonaut, were already onboardbefore the newcomers arrived. Though the logistics of coordinating the largercrew are a bit more complicated than before, the influx of people hasn't causedtoo much disturbance, Barratt said. "I don?t think the routine has changed that much,"he said. "There's a lot more of us, and we still tend to congregate in theRussian service module for breakfast. There's just a lot more people to sharesome stories." Not only is the station crew now larger than it's ever beenbefore ? it'smore international. For the first time all five of the station'sinternational partner agencies are represented on orbit at once: NASA; theRussian Federal Space Agency (Roscosmos); the Japan Aerospace ExplorationAgency (JAXA); the European Space Agency (ESA); and the Canadian Space Agency(CSA). "We've had the international flags up for a while, andhaving our new colleagues come gives them much more meaning," Barrattsaid, referring to the flags of member nations that hang in the space station. For Romanenko and Thirsk, this trip is a first visit to theISS. "I think the greatest challenge will just be to get myworking efficiency up," Thirsk said Monday. "We've been here fivedays now and I think we've learned a lot. I just hope I can get through my sixmonths here without making any serious mistakes." The long-duration mission will be made slightly easier byfrequent calls and e-mails home to family, he said. "We communicate every day," Thirsk said of hiswife and three children. "We have e-mail and an internet protocol phone.Once a week we'll have a planned video conference as well." The station can accommodate the larger population thanks toa few home improvements made recently. Last week the space station's new urinerecycling system was officially activated, allowing astronauts to drinkpurified water reclaimed from used water and bodily fluids. The device helpsprovide enough potable water for all six crewmembers on the station withoutrequiring heavy loads of water to be ported up to space by shuttles and cargoships. Despite the icky-sounding concept, the system has beenworking out well, the astronauts say. "The water's great," Barratt said. "It'sprobably as good as or better than anything you'd buy out of a fancy bottle onthe ground. It's a very convenient system. Absolutely no complaints about thewater up here." It will come in especially handy when the space station hasto accommodate even more people in a few weeks. Seven astronauts are scheduledto lift off June 13 toward the station aboard the space shuttle Endeavour'sSTS-127 mission. When they arrive at the ISS for a planned 16-day constructionmission, they will boost the total number of people onboard to 13. "With 13 people up here it'll be a challenge,"Barratt said. "It'll be busy, there will be a lot of coordination." Nonetheless, Barratt said he didn't mind things gettingcrowded, since he comes from a family of seven on Earth. "I feel very much at home," he said. "I comefrom a large family and I'm used to a lot of activity, business, and a lot oflaughter, and we certainly have that now."